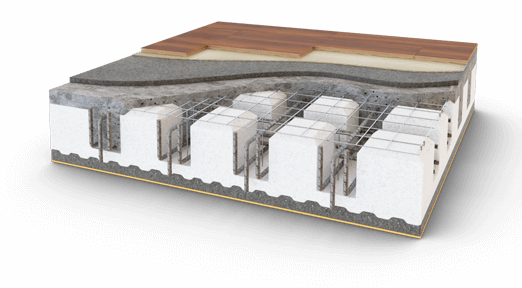 The heart of the System is the Emmedue single panel in expanded polystyrene: modular, not prefabricated and enclosed by a double-galvanized steel mesh joined by connectors. The panel is industrially produced and it is then assembled and completed directly on site with two layers of concrete. The self-supporting panels can be made in various shapes and cover the entire range of elements necessary to finalize any type of project in the building industry. Thanks to the Emmedue panel, the Emmedue Building System allows high-quality structures to be built at a very economical price, due to the efficiency achieved in the construction of the works, the movement and assembly of the panels. The modularity of the Emmedue System affords absolute design flexibility and high degrees of integration with other building systems. Likewise, the simplicity of the assembly, the extreme lightness and manageability of the panels allow the realization of any type of building, even in adverse working conditions, earthquake-prone areas and climate extremes. The Emmedue single panel is made up of expanded polystyrene, modular, enclosed in a double-galvanised steel wire mesh linked by connectors, to be finished with two layers of concrete. 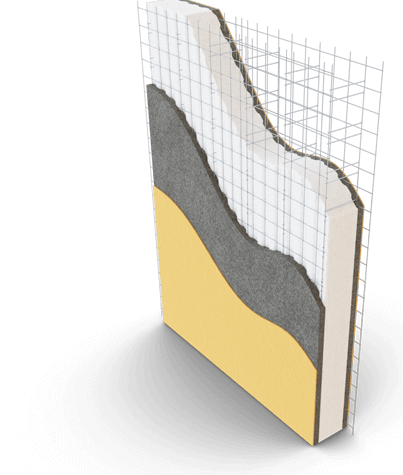 Used as a supporting structure, for buildings up to four floors, with application of structural plaster on both sides. Perfect for partitions and claddings in new or refurbished buildings; as claddings and partitions in large-sized industrial and commercial buildings; as insulating frameworks for roofing and moderate spam floors. 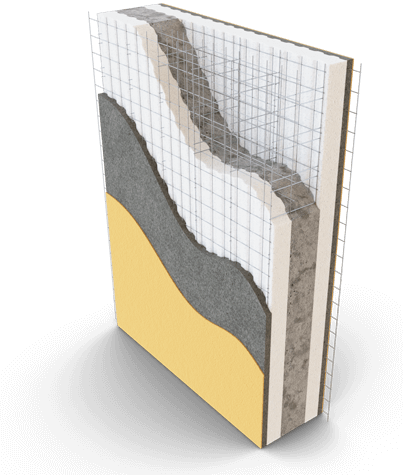 Ideal for walls, partitions, cladding, floors and roofs. The Emmedue double panel consists of two single panels, suitably shaped and joined together with double horizontal connectors that are inserted into a space to be filled with shotcrete of appropriate characteristics and resistance. The thickness of the shotcrete septum inside the double panel, as well as the characteristics of the shotcrete itself, will be determined according to the structural requirements. The panel is finally completed with the application of the external shotcrete. The double panel comes with reinforcement certified by an Official Laboratory in accordance with the Law 5/11/1971 no. 1086 -D.M. 14/01/2008, complying with the provisions concerning reinforced concrete structures as stated by the EUROCODE 2 (EC2). Ideal for R.C walls such as load-bearing walls and ground. Panel for creating floors and roofs with reinforced concrete beams, with considerable advantages in terms of lightness, insulation and assembly speed. 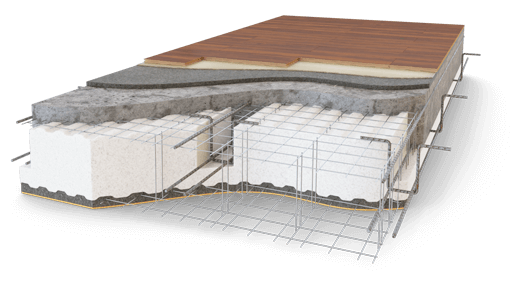 The Emmedue floor panel is composed of a molded sheet in expanded polystyrene, floors and roofing of buildings with the supplementary steel additions in special joists and subsequent casting of cement mix. Ideal for floors and roofs with reinforced concrete beams. The stair panel consists of an expanded polystyrene block, shaped according to the design requirements and sandwiched between two steel wire meshes. Once this panel is properly reinforced and completely casted in the appropriate spaces, it is ideal to build stairs that can be superficially finished with traditional plaster, tiles or any other finishing materials. The stair panel is characterized by its quick and easy installation, combined with a distinct lightness and structural resistance. 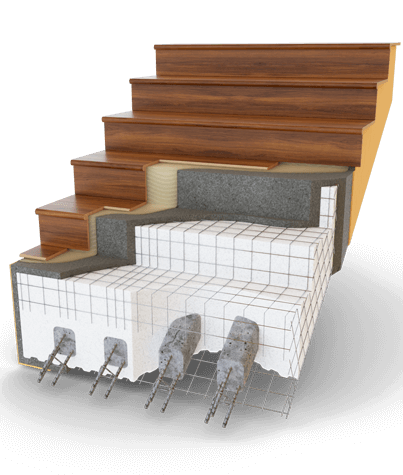 Ideal for lightweight and resistant staircase that are fast to carry out. Panel used to build landings, floors and bi-directionally reinforced plates. It gives continuous insulation to the intrados of the panel. The Emmedue landing panel is an excellent solution to building landings adjacent to staircases made with the Emmedue stair panel. The landing panel can also be used for any plate or slab in R.C. to be reinforced in two directions, with the advantage of a considerable reduction of weight compared to a solid slab, and the presence of a continuous insulation that also acts as a formwork. Ideal for landings, floors and bidirectional armed plates. The curved panel is a special panel, of great dimensions and thickness, produced in the factory in a flat shape and arranged to be curved, later, on site. Thus, the panel produced is easily transported and then, manually or semi-automatically, curved on site into the desired form, using a pneumatic tool designed by Emmedue. The main advantage of the panel is the ability to cover large surfaces quickly and conveniently. Moreover, these panels allow architects to be more creative and test new shapes. 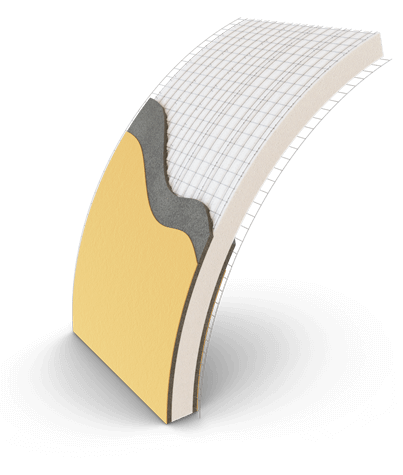 The curved surface enhances the air circulation, reducing the potential moisture and improving the thermal performances of the houses.